It well and truly feels like summertime, now. There isn’t much of a spring in Virginia. Well, there isn’t much of any season in Virginia. Temperatures tend to bounce heedlessly from one extreme to the next, cycles of aggressive weather patterns plaguing the day-to-day. Take this past weekend, for example: a downpour of Biblical proportions, only for a few subsequent afternoons of dull humidity and light breezes. Thirteen years in this state have trained me to be prepared for uncertainty and carry a fresh change of clothes for 20 degree temperature changes on any given day. What is certain, however, is the unmistakably bone-deep feel of lethargy and idleness that hangs like an overcast, as though each day stretches on for weeks at a time. I myself have spent the past few weeks primarily in my car, driving from city to city with boxes of novels and cookbooks, transporting years’ worth of clothing and photo frames from the apartment to my parents’ house. Yesterday was my last day in the apartment, actually (read: I am officially a member of the dreaded recently-graduated-yet-indefinitely-unemployed pool of sad, sad 20-somethings), but memories of spending hot afternoons with Walt Whitman and nights wandering amidst a gloriously silent campus are fresh in my mind. Back when I was still working long hours in the basement of Digital Services, I lived for my sixty-minute lunch breaks and the opportunity to caffeinate before a few more hours spent in the company of Leaves of Grass manuscripts. There was one particular coffee shop I frequented around grounds, a 5-minute walk from work and perfectly empty during summer hours when all the students have left the city. Rickety wooden tables and old, worn couches, assorted mugs that are chipping in places and local artwork lining the walls. Almost too deliberate in informality, but it was pleasantly quaint. What I liked best about it, though, was the view of the train tracks from the second floor windows. So much of my fourth year was spent holed up at one of the tables upstairs, bundled in scarves with a stack of books by my side, spending more time glancing outside than writing my thesis. I’d stop when I’d hear the telltale rumble of the Amtrak making its way out of town; watch it languidly drive by. It was always immeasurably calming. Not that I like the Amtrak, mind, especially as someone who generally likes to make it to her destinations on time. But I do enjoy trains. They are my preferred method of travel if not walking. Cars are too hectic and expensive, and planes too claustrophobic. But there’s something wonderfully effortless about the train. Space enough to stretch one’s legs; few enough passengers to curl up on two or three seats for a nap; tranquil enough to read without fear of nausea and to get lost in thought while watching the countryside drift by. Trains remind me of summer. I ride them so rarely, especially here in the States, but some of my greatest memories of summer breaks are hours spent on European trains. Not that they were memorable because they were European, of course. A train is a train, after all. The track is what’s memorable. Such a personal experience — intimate and almost secretive — catching glimpses of sights before they disappear from view. My earliest memory of the train is one ridden through Zurich, watching the snowy mountain tops peeking out behind buildings in the Old Town. We took the train twice a day during my summer in Italy, making our way into Rome by means of the countryside. 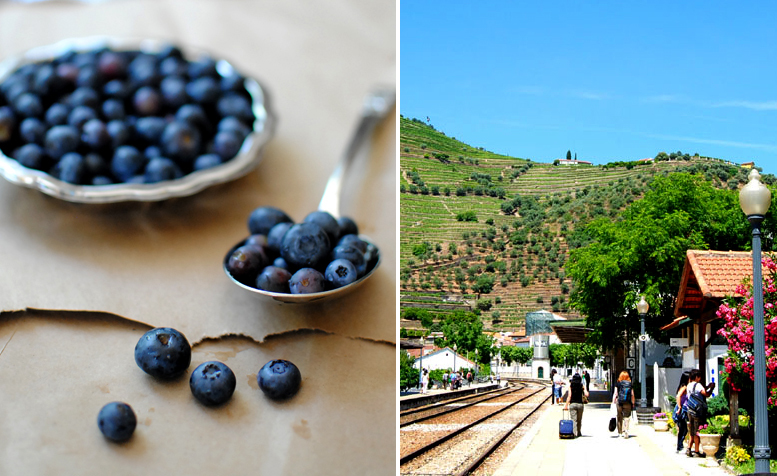 Most recently (minus a few Amtrak debacles when traveling to Boston last autumn), I dreamt of hours-long train rides to and from Pinhão, journeying alongside the Douro River in rushes of greens and blues. I’ll be off again soon. Not on a train, but a plane ride across the ocean to a new country for a while. Turkey, this time. Caught in a wildly exciting torrent of political and social change, the surface of which rests upon layers of rich history and culture, almost mystical in its deeply spiritual fusion of east and west. One of my big plans is to travel by rail from city to city; watching the sights, committing them to memory. Another summer measured in train rides. 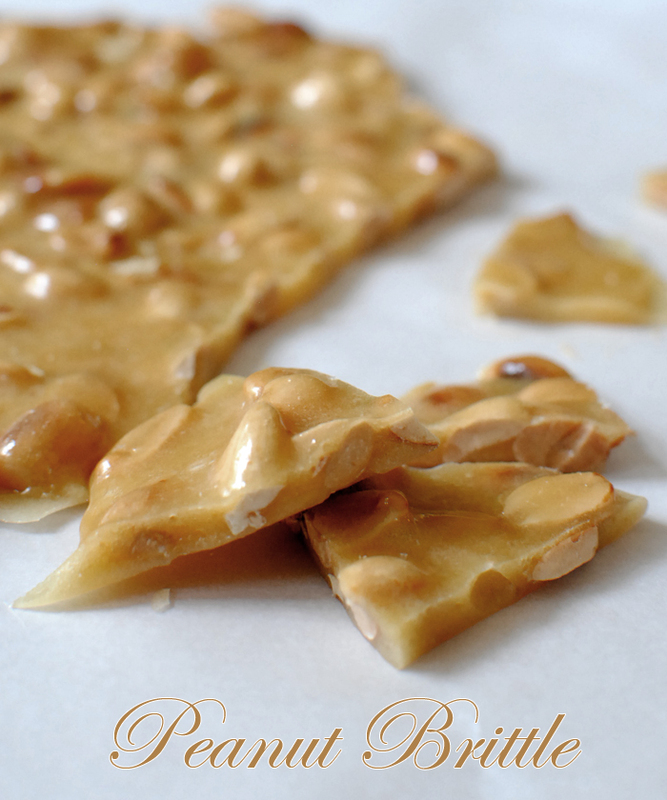 Incidentally, summer also reminds me of peanut brittle. 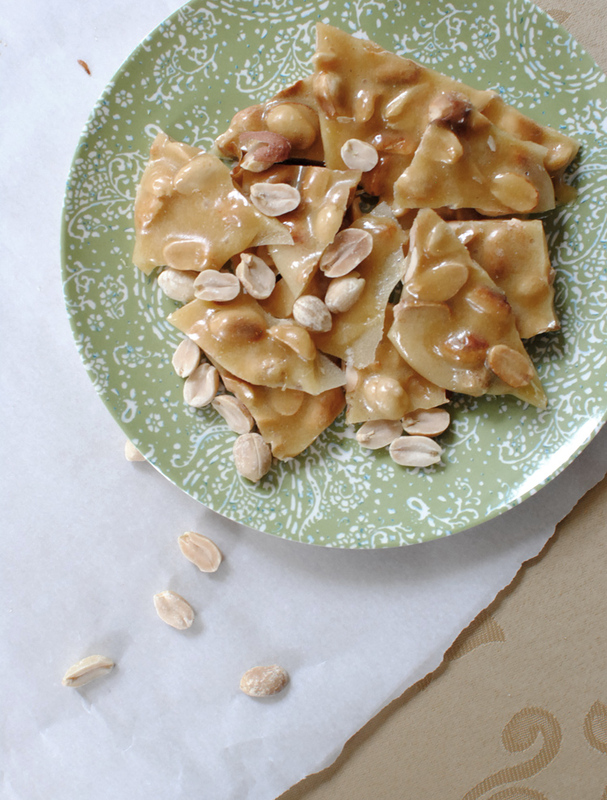 A bit peculiar, perhaps, since peanut brittle so typically arrives among boxes of loose teas and cans of caramel corn in Christmas baskets. But over the course of the past three years, I spent many free summer afternoons in Cville driving to the top of nearby mountains to visit apple orchards and gift shops stocked with homemade nut brittles and apple butters lining the walls. I also spent many of my paychecks there. These were made as a gift, one to be taken overseas for a family that will become mine for a while. A truly Virginian gift, I think, a small taste of home that I’ve grown to love over the past few years. Tonight marks my last night in town, in fact. It’s a bit surreal, really, and I doubt it’ll hit me until I’m a thousand feet in the air, cruising above the Atlantic with headphones in my ears, when I’ll suddenly realize that dear God I am about to spend 8 weeks in a country where I speak absolutely none of the language and what on earth am I doing. I also imagine I will then burst into tears from a mixture of exhilaration and sheer hysteria, but, you know, I’m pretty composed at the moment. Don’t get me wrong, I am wholly excited about the prospect of getting to know and fall in love with a new city; surrendering myself to the many histories of Anatolia, letting them sink into my bones. What I find truly frightening is the thought of coming back. Not because I don’t want to or anything, but because things will be so different. I’m back in late August. By then, Yusra will be spending lazy afternoons in a dorm, having moved out for her first year at uni. Friends from the last few years will be packing up to go on to PhD programs in Texas, Washington; signing up for law courses at Harvard and Princeton; resigning themselves to a few weeks as naive first years for the last time. A few are stepping into the working world, setting up independent bank accounts and figuring out schedules to pay back student loans, all the while hiding sheer panic behind a composure of professionalism and poise. And others, perhaps a bit lost for now, panic not quite as well hidden, but as determined as the rest. For the moment, they’re on summer break — their last summer breaks — and making the most of it. When I’m back, though, they’ll have closed the chapter on the part of their lives I shared, writing the first paragraphs of a new story. One that I absolutely cannot wait to read, mind, whether over coffees or on the net. But for many, I won’t play a part. And that’s not a tragedy, of course. That’s just time. That’s life. And yet, it brings with it a profound feeling of loss, a bittersweetness in the acceptance that it rushed by without my noticing. It makes me smile, but it makes me sad, too. And to be honest? It’s the first time in my life I well and truly feel out of my depth. Financially, academically, intellectually. About everything. Driving away from the apartment I’d lived in for 3 years, taking for granted a few years of academia when my decisions were dictated by major requirements and employment… Now? Now I don’t know. I’ve been in school for 16 years and all I’ve realized is that I don’t know. I’m not sure that I ever will. I’m not sure anyone ever does. I think life is just about making the most of not knowing anything. Fitting, I suppose, in the end. Perhaps I’ll learn something more than just Turkish in a few weeks. And I’m sure you will have written a thousand pages of your own by the time I’m back. Line a baking sheet with parchment paper. Have all ingredients measured out before starting. Combine sugar, corn syrup, water, salt, and vanilla in a 2-qt pot over medium-high flame. Bring to a low boil, stirring occasionally. 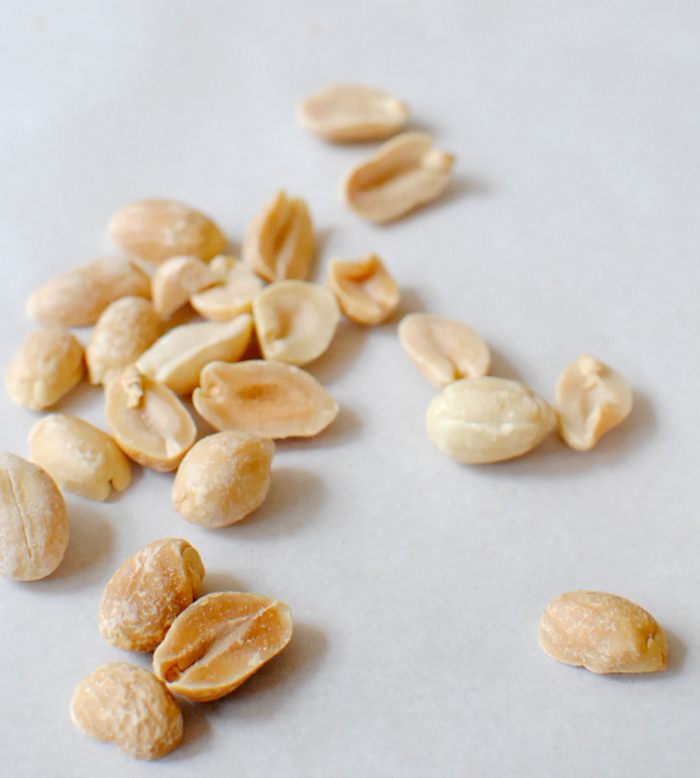 When all sugar has dissolved, stir in the peanuts. Allow mixture to boil until a candy thermometer reads 300F (note: once sugar reaches 250F after 4-5 mins, it will rapidly heat to 300F), or until amber-coloured. Sugar is at right temperature if it hardens when a splash is dropped in a saucer of cold water. Once 300F, remove pan from heat and toss in baking soda and butter. Stir until blended. Immediately pour contents of pot over the parchment paper. Gently turn the pan so that the caramel spreads out. Allow brittle to cool completely. Roughly break the bark into pieces when set. Store in an airtight container. Recipe is 100% gluten free. I imagine you could substitute the peanuts for pecans or walnuts if that’s your fancy. Double the recipe if you plan on making as a gift. I guarantee you will not be able to keep your paw out of the jar! Reading your blog again! It’s been a while. I’m always so impressed with your writing- it’s like reading a light novel with a surprise at the end! :) a recipe. I’m sure Turkey will bring you new adventures and a new perspective in life. You are capable of so many things. You are person with so many talents- talents that always amazes me every time I see you. All I have to say is that I’m pretty sure that most people don’t know. And if they say they do, well…they are probably lying to themselves because they are in for a helluva ride. I’m with you there- life scares me to death. But I hope that down the road, I can still rely on my friends for a chat or advice. And I really hope that we can still meet up for the occasional lunch or dinner. :) Or as I’ve read and as you’ve drank so often, coffee. You’ve brought a lightness to my heart that I didn’t realize I needed until I read your comment. Thank you, darling, it means so much. I can’t wait to hear about your summer once I’m back, and to be kept updated on your experiences as an MA student in the years to come! !